Joining iRedeem is free and simple. Sign up now or in-store at your favourite iRedeem partnered business. Within a few minutes, you can save money at Edmonton’s local places to shop and eat. Many iRedeem partners offer the iRedeem points program. Customers earn points and then can cash in those points to use at any participating iRedeem partner. 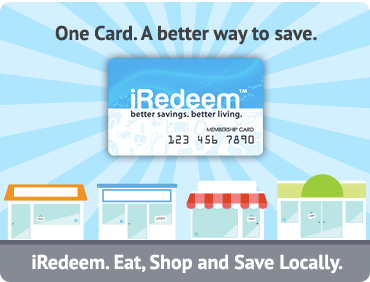 iRedeem points never expire and will always be accepted by participating partners. Some partners may temporarily sell out of vouchers, but we‘ll make sure to let you know when vouchers become available again. Only 1 voucher per transaction. A growing number of the iRedeem partners offer deals and discounts through iRedeem. These deals are exclusive only to iRedeem customers. Discounts are typically a straightforward percentage of any purchase, while deals can range from free items to larger benefits. Whatever the savings you get from an iRedeem partner, we look to make it as simple and straightforward as possible – so you know what you‘re saving. Please call 1-866-357-9628 or send us an email at info@iRedeem.com with questions.